Around the country Wednesday, including at Pitt, students on college campuses “walked out” of classes in favor of equality and safety from deportation in a country largely divided over immigration issues. In front of the Cathedral of Learning Wednesday afternoon, between 50 and 60 students gathered to advocate making the University a safe space for undocumented students, as well as to appeal for greater protection of the rights of minorities in the wake of the recent presidential election. The rally was part of a nationally organized campaign, called National Walk-Outs for #SanctuaryCampus by Movimiento Cosecha, an organization launched in 2015 in Milwaukee, that pushes for the protection of immigrants in the United States. There are about 300 “sanctuary” jurisdictions across the United States, including Pittsburgh and other cities in California, Connecticut, New Mexico and Colorado, according to the Center for Immigration Studies. Although each has a different set of practices, cities often refuse to enforce national immigration laws and do not prosecute people solely for being an illegal immigrant in the city they are currently living. Over the past week, protests around the country related to immigration have come in response to President-elect Donald Trump’s 10-point immigration plan which seeks to build a wall on the southern border, deport undocumented immigrants who have committed crimes and end sanctuary cities. Jordan Hayes, a graduate student studying English, heard of the #SanctuaryCampus protest through Facebook and liked the idea of making campus a safe haven for immigrants. At Pitt, student groups Pittsburgh Student Solidarity Coalition, Pitt Against Debt and Students for a Democratic Society posted the event on Facebook, and about 300 people responded. The turnout was small compared to other anti-Trump-related events — including a march from the Cathedral to the South Side later that night. 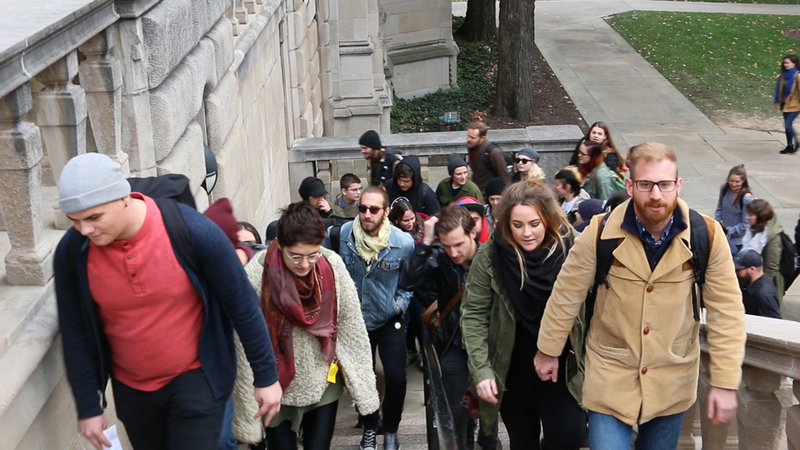 Students chanted “No borders, no nations, stop the deportations,” as they marched up the Cathedral’s front steps, heading to the chancellor’s office. Joseph Zubrow, a sophomore chemistry and English writing major, kicked off the rally by reading a letter addressed to the University community, imploring administrators to adopt and enforce policies protecting freedom and inclusion. The letters’ writers asked the University to adopt policies such as prohibiting housing discrimination based on immigration status and refusing to comply with federal or state laws that target members of the LGBTQ+ community. “The University’s pledge to uphold the values of inclusion and freedom must also not just be words. We must make concrete changes to protect all members of our community in the face of very real attacks on freedom and safety,” the letter read. After reading it aloud, Zubrow and the protesters marched through the Cathedral and crowded into the chancellor’s office, where they gave the letter to the senior vice chancellor Kathy Humphrey. Humphrey thanked them and said she would pass the letter on to the chancellor. Pitt administration could not be reached afterwards to comment on the letter. Anna Josephson, a senior communication and sociology major, said she came to take part in the protest to support making Pitt a safe space for undocumented students — school-age immigrants who either entered the country without documentation or entered as a nonimmigrant and stayed without authorization. Josephson said that she’s refusing to let the outcome of this election allow xenophobia to grow on campus. According to Zubrow, more needs to be done in the Pitt community to raise awareness about groups they consider to be at risk after Trump’s election, such as undocumented immigrants. Other campuses across the nation participated in the walk out, including Rutgers University, Amherst College, Swarthmore College and Syracuse University. According to Justin Mattingly, the editor-in-chief of Syracuse’s student paper, the Daily Orange, the campus also held a walkout, where about 1,000 students left class to gather in the central quad and march around campus for an hour and a half. Students spoke before and after the march on topics such as climate change, LGBTQ+ rights and undocumented students. According to Mattingly, the chancellor of Syracuse issued a statement saying Syracuse is for everyone, although the school has not made a statement regarding how the university will react to new policies that could be introduced this January. At the University of Wisconsin-Madison, students and professors advocated for the protection of undocumented students through an online letter. The letter asks the chancellor and other administrators to officially declare the university a sanctuary for undocumented students and those who benefit from Deferred Action for Childhood Arrivals –– a program that allows certain immigrants to receive renewable two-year work permits. More than 4,500 students, faculty and community members had signed the letter by Wednesday night, according to Laura Minero, a doctoral student at Wisconsin-Madison who was involved in writing the letter. The letter is still circulating, but administrators agreed to speak with the authors of the letter about their concerns. “We decided to voice our concerns after the election through a letter, instead of a protest, since we thought it’d get more people beyond campus involved and let the university know that a lot of people care about this,” Minero said. For Sarah Conboy, a junior applied developmental psychology major at Pitt, the protest Wednesday was important to support gender and racial equality, as well as the rights of undocumented students.